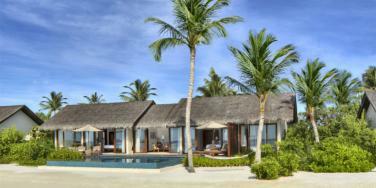 Guests staying at least 4 nights receive free return domestic flight transfers and speedboat transfers. Valid for two people per bedroom. All honeymooners receive a complimentary bottle of wine on arrival, a sunset cocktail for two with canapes at The Beach Bar, a romantic in-villa bath set up and an in-villa breakfast. Honeymooners staying at least 7 nights on a half board basis receive free lunch on paid nights.